I’m very pleased to announce the publication of my third novel, The Geography Lesson, which is available via Amazon Kindle and other sites. In the days ahead, it will be available through the iBookstore, the Nook store, and all such upstanding digital retailers. The Geography Lesson is a novel about the consequences emanating from a botched expedition by the National Geographic Society– which may be the last great Washington institution never to have come under the scope of a comic novelist. Forty years after the 1968 discovery, and subsequent looting, of a magnificent Anasazi ruin in Utah, the novel’s narrator, a retired National Geographic writer, spies in a magazine a photo of a vase he last saw in an obscure canyon out West all those years ago, and in an instant, he knows exactly who betrayed him — and one of America’s most storied institutions. Ready to learn more, maybe even ready to buy it at the low, low price of $3.95? Well, you can go you can go directly to TheGeographyLesson.com. Ready to go to the website and buy it? Look, we often don’t come out from behind the mask of Tulip Frenzy, but in this instance, allow me to say this. I believe The Geography Lesson is stronger than either of my two well-reviewed prior novels, Family Politics or Statute of Limitations. It’s a fun read, if I do say so myself. Leave a review on the Kindle page. You could tweet out a link to your zillions of Twitter followers. 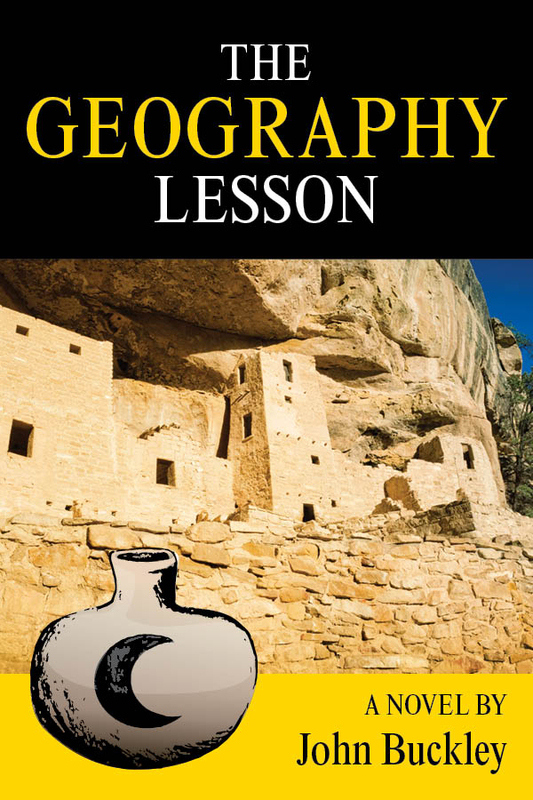 (A cut-and-paste ready sample: “Go read the new novel by @johnbuckley100, The Geography Lesson, which is really terrific!” And then you could link to TheGeographyLesson.com. Oh, and by the way, go ahead and follow @johnbuckley100 on Twitter, and I’ll keep you posted on the book’s progress. Post a link on your Facebook page and alert your zillions of friends. The most important thing, though, is reading the book, which I hope you enjoy. This entry was posted on May 6, 2013 at 2:08 pm and is filed under Uncategorized with tags "Family Politics", "Statute of Limitations", John Buckley, National Geographic, National Geographic Society, Robert M. Poole, The Geography Lesson. You can follow any responses to this entry through the RSS 2.0 feed. You can leave a response, or trackback from your own site.